Finding the dress , for most brides, is the most exciting part of wedding planning. Every little girl dreams about her long white veil and princess wedding dress. The reality of the matter is that not every grown up bride wants a ball gown anymore. Searching through the thousands of wedding dresses isn’t always easy. With styles from ball gowns, to empire waste, to A-line, there is the perfect shape for every bride-to-be. Starting with the basics, you must find a local store. Shopping online is always fun but the best way to get an idea of what you’re looking for is to try on all different styles, colors, and fabrics. For our Birmingham brides, check out places like The White Room, Ivory and White, Belle Couture and Carriage House Weddings. Most bridal boutiques want you to make an appointment, that way they have more time to focus on each individual bride. Finding the right shape can be an adventure. Try on all different styles event if you know what you want because why not have some fun! You only get to be a bride for so long, enjoy it and step outside your comfort zone, even for a moment to try something different. Many websites will say, “if you’re this shape then you need this dress”. I say try at least one of each and decide for yourself. This is probably the most well known shape for bridal gowns, but don’t write them off as simple. An A-line can go anywhere from traditional to modern. 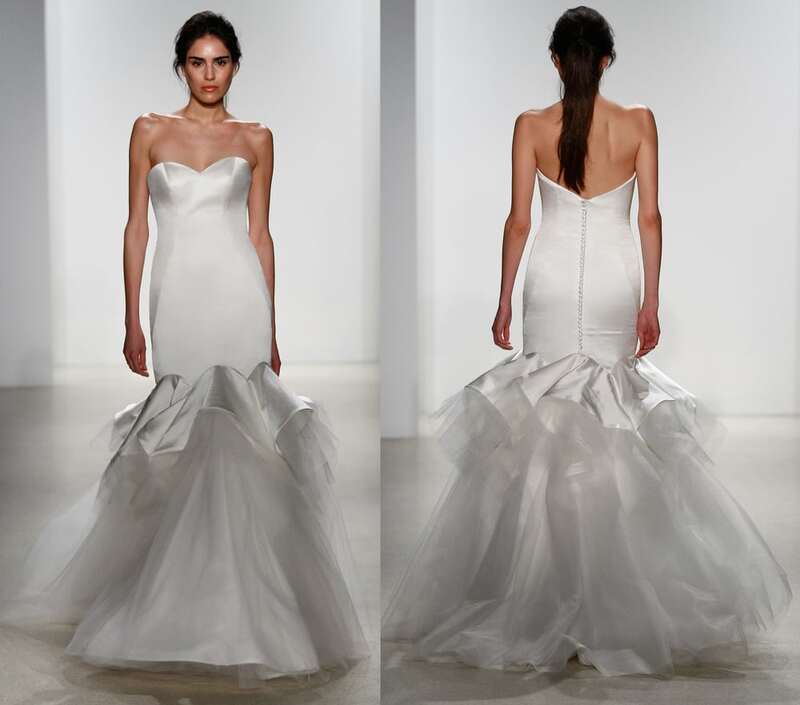 Paloma Blanca is an amazing design with a plethora of beautiful A-line dresses that can be found at The White Room. When you think of a princess wedding you think of the beautiful ball gown the bride wears. 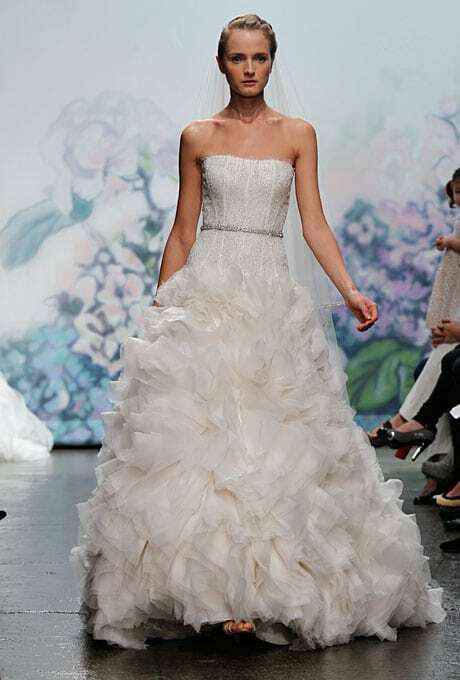 It’s a real life fairytale come true and for some brides a ball gown is the perfect dress for them. The possibilities with a ball gown are endless. Hayley Paige is a talented designer with a modern take on ball gowns. Her gowns can be found at Ivory and White in Birmingham. 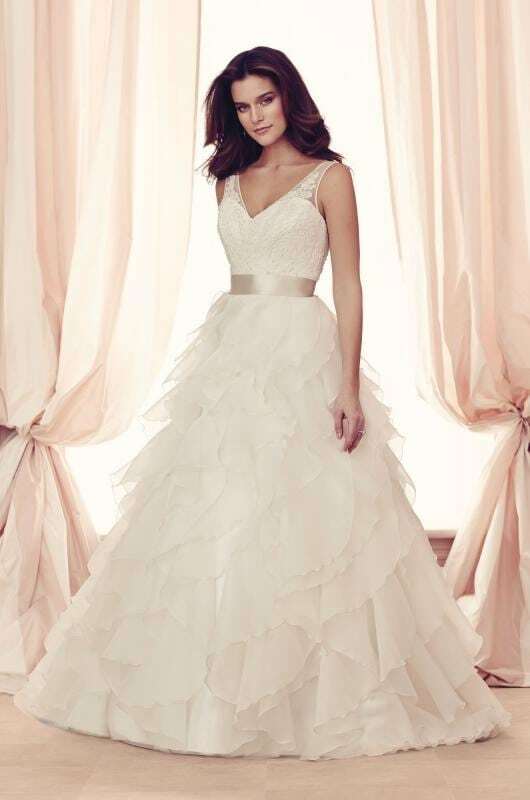 Paloma Blanca also offers beautiful wedding gowns that are a bit more traditional if that’s the look you wish you achieve. 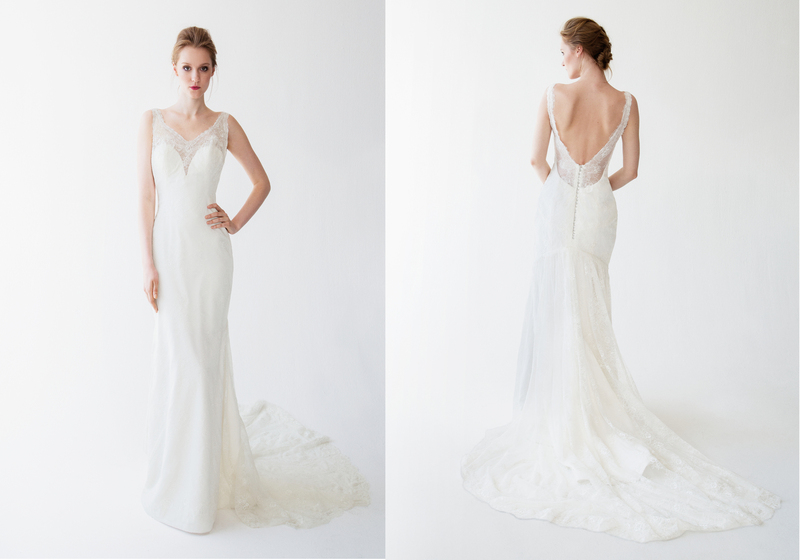 For a bride wanting to show off more of her figure a fit to flare or mermaid dress is the perfect fit. It gives the bride a little more appealing look without straying from a classic look. Kelly Faetanini has a large collection of fit to flare dresses from simple and elegant to sassy and fun and she can be found at Carriage House Weddings. If you’re a bride that just wants something different. If you want a dress that people will remember for years to come, maybe a couple of these options are for you. A dress represents your personality, and some girls just need something that speaks for itself.